Before we get started, I want to acknowledge that all women have different views, experiences and feelings around aging. Some embrace it, some resist it. Some have people in their lives who celebrate aging, and some criticize them for it. I acknowledge that this is a sensitive topic. That said, I’m going to approach this post from things that *I* have learned about aging and perspectives I’ve gained. Please feel free to have different views/beliefs from mine, as you read along. Okay, not everyone… but A LOT of women have botox. Now, as I share this, please don’t think I’m pointing this out as a judgement – I’m not. It’s simply something I’ve learned as I’ve gotten older. When I was in my early 20’s I viewed botox as something that only women in Beverly Hills did. Something that was for women in their 50’s or 60’s. 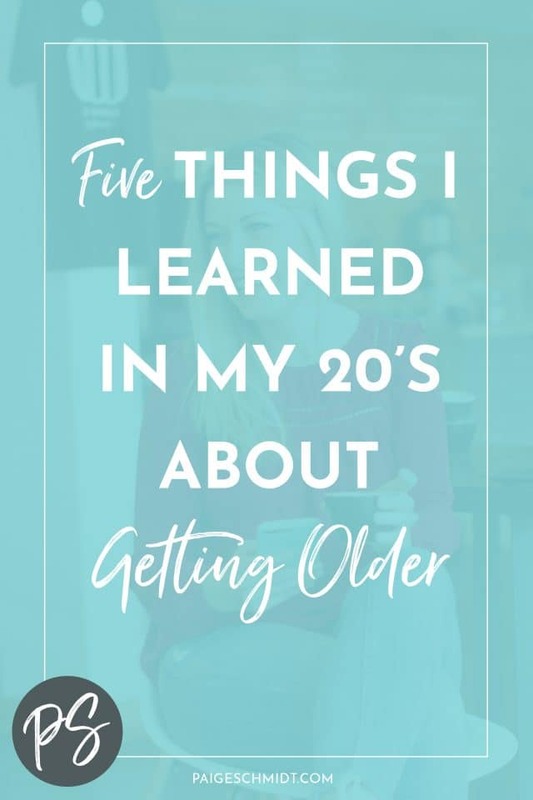 But as I’ve learned, most of my twenty/thirty-something year old friends have botox. News to me! My view: super neutral. If you want botox, embrace it. If you don’t, embrace it. Your body, your choice! You do you. I’m just gonna hit straight to the core on this one. My view about aging shifted dramatically when my mom passed away at the age of 63. When my mom was literally laying in her death bed (I know that’s a little intense, but it’s the truth) the only thing she wanted was more age. Age was a blessing. A gift. Something that she didn’t get to have more of. I know that probably sounds really deep and intense to those of you who haven’t gone through losing someone as close as your mom, but it’s the God-honest truth. It was in that season of my life where my view of aging turned from something to fear to something to be immensely grateful for. The fact that I get to be here, today… is such a gift. The fact that I get to work, to write to you, to be in love on this earth, to enjoy laughing. To feel things, to cry, to have conversations in-real-life is a gift that aging brings. So I see aging as a gift. As something to celebrate, to look forward to, and to be nothing but grateful for. I love to dream about the future. To write paragraphs and lists about where I’d love for my life to go. To write about what I’d love to create; to have; to do. I think there’s magic in writing things down. If you want something, write it down! Have fun thinking about the future and never stop dreaming. Wise women. Don’t you love them? They’re the best. I have a handful of women in my life who I consider to be wise and I love going to them for guidance. I love hearing stories of life from those who have lived more years than I have. It doesn’t matter how old you are: if you’re insecure about your age, you’ll be insecure about it. I know women who are going after their dreams at 21 and women who are going after their dreams at 60 – even if they’re afraid, they’re going for it. I also know people who AREN’T doing what they’d like to be doing because of their age and the only difference between them is their decision to do so. I started my job at 20 even though I thought people might think I was too young. Did it anyway and am SO BEYOND grateful to my 20-year-old self for not waiting. Thank you, young Paige. It’s a gift to be alive and if you can show up to each day remembering that, your perspective will change. If you think of a goal in life as “to age” maybe you won’t be so hard on yourself about it, if you’re struggling with that. If you focus on what you perceive to be negative about aging, you’ll probably have a negative experience aging (remember, it’s only your perception). Make the most of it, love hard and never stop dreaming/creating the future.